Vermont Sourdough with Increased Whole Grain, from Hamelman's "Bread"
I can't believe six months have gone by since I made Hamelman's Vermont Sourdough with Increased Whole Grains. 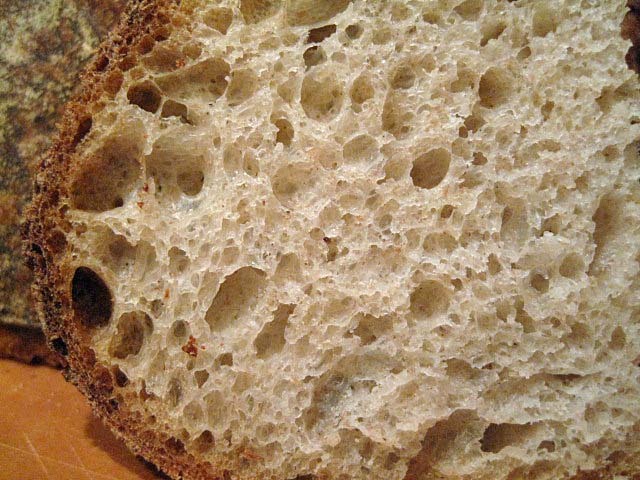 (See Vermont Sourdough with Increased Whole Grain, from Hamelman's "Bread") I liked it so much the first time, I promised myself I would bake it again soon to see if was consistently so good. So, I forgot about it. I'll blame the NY Baker's test baking pre-occupation of the Summer. A few days ago, I was thumbing through “Bread,” deciding what to bake this weekend, when I re-discovered this formula. A happy moment. My second bake of the Vermont Sourdough with Increased Whole Grain confirmed the wonderfulness of this bread and my personal preference for it over the basic Vermont Sourdough. The night before mixing the final dough, feed the liquid levain as above. Ferment at room temperature overnight. Mix the final dough. Place all ingredients except the salt in the bowl and mix to a shaggy mass. Cover the bowl and autolyse for 20-60 minutes. Sprinkle the salt over the dough and mix using the paddle of a stand mixer for 2 minutes at Speed 1. Add small amounts of water or flour as needed to achieve a medium consistency dough. Switch to the dough hook and mix at Speed 2 for 6-8 minutes. There should be a coarse window pane. Transfer the dough to a lightly oiled bowl and ferment for 2.5 hours with one stretch and fold at 1.25 hours. Divide the dough into two equal parts and form into rounds. Place seam side up on the board. Cover with plastic and allow the dough to rest for 20-30 minutes. Form into boules or bâtards and place in bannetons or en couch. Cover well with plasti-crap or place in food safe plastic bags. The next day, remove the loaves from the refrigerator. Pre-heat the oven at 500ºF with a baking stone and steaming apparatus in place. After 45-60 minutes, pre-steam the oven. Transfer the loaves to a peel. Score them. Load the loaves onto the stone and pour ½ cup boiling water into the steaming apparatus. Turn the oven down to 460ºF. After 15 minutes, if you have a convection oven, turn it to convection bake at 435ºF. If you don't, leave the oven at 460ºF. Bake for another 25 minutes. I got the same crackled, crunchy crust and moist, chewy crumb as I did the first time. The flavor was more assertively sour than I remember, which is fine with me. The overall flavor was delicious. The sourness did not detract from the lovely complex wheat-rye flavor that is my favorite. Great, David! 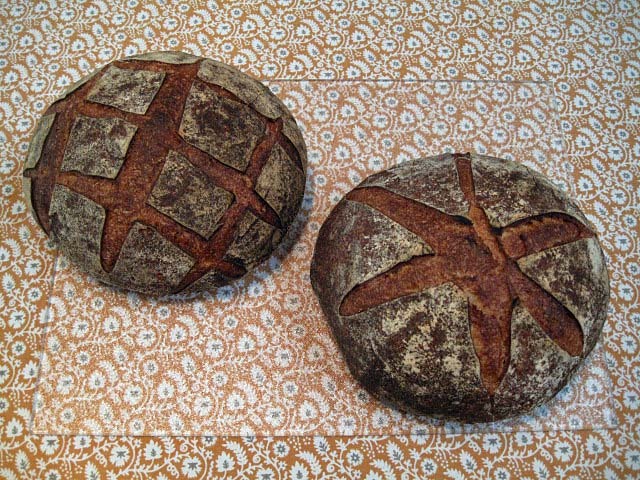 Lovely Vermont Sourdoughs, Baked to perfection. 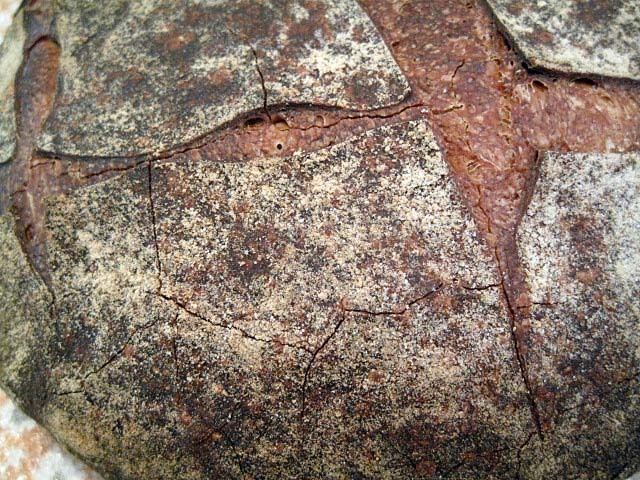 Crust , Crumb, all indicate a professional bake. I've tried it once, though at the time, i wasn't all that much into sourdoughs. Yes, it was assertively sour, in a pleasing way. I love how you bake you loaves to perfect caramillization, but concerned that toasting will burn the crust. I just finished a couple slices of toast. Crust just gets crunchier. Not burned. I have to agree with Mebake, as I thumb through your past post, your loaves always have a rich crust color. Nice and bold. Yup. Cast iron skillet with lava rocks. Stay tuned for a tweak on my steaming method. I'm going to try the method recommended for home baking by SFBI, as soon as one piece of equipment arrives. I too love the unique and delicious flavor of wheat and rye combined. It must be wonderfully enhanced and showcased by the lovely brown crust. Congratulations, David! Beautiful loaves. Maybe I'll try that one next. what a lovely crumb structure. Looks beautiful and delicious, David! I will be forever envious of the crusts you get from your bakes. Just gorgeous looking hearth bread! You can include me as another fan of your crusts David. A beautiful loaf of bread you've made! Do you have it on the bottom of your oven or on the lowest shelf and what do you use to pour the water into it? I'm thinking one of those long spouted olive oil cans might help get me a little farther away from the blast furnace! My setup is: Baking stone on the middle shelf. Skillet with lava rocks on the lowest shelf (not on the oven floor). I pour water into a pyrex measuring cup to pour over the lava rocks. DO wear an oven mitt on your pouring hand. You can use (non-lead-containing, non-galvanized) nuts and bolts or rebar pieces instead of lava rocks. But when have you baked a bread that wasn't? All my breads are not "gorgeous." Some are so ugly they're funny. I've posted "the best of the worst" from time to time. The ones that are ugly, but not ugly enough, you don't get to see. Finally had a chance to sit down and give your post a proper read through and have a question for you if you don't mind. 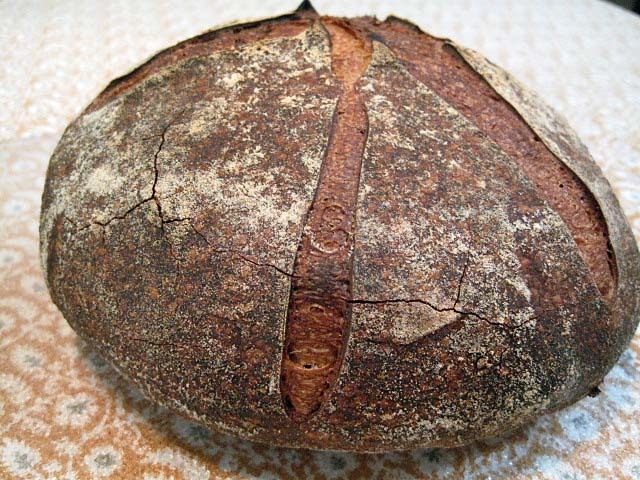 Later this evening I'll be making Hamelman's Sourdough Seed bread. Like the Vermont Sourdough with increased Whole Grain it uses a liquid levain, which may or may not have a bearing on my question. I noticed in step 4 of your method that you use a paddle to mix at this stage and then switch to the hook for the second speed mixing. Since this isn't indicated in Hamelman's method I'm wondering if this a technique you've used previously or is it one that you learned during your course at SFBI and have incorporated into your mixing procedure. Your results speak for themselves as the crumb on your bread is outstanding , so I'm wondering if this is partially due to using this method. It would seem that you'd get a fairly rapid gluten development in this initial mixing stage by using a paddle, but I'd be interested to know your thoughts on how ..or if it helps you achieve such good crumb on your loaves. Almost all of Hamelman's mixing instructions assume you are in a commercial bakery and using a spiral mixer with a 20 qt or larger capacity. These mixers only have one (spiral) mixing blade and two speeds (except for those that have one speed). They are very efficient with their optimal quantity of dough. Hamelman's times are for these mixers. A planetary mixer, like a KitchenAid, will take longer to achieve the same result. So, Hamelman doesn't discuss the paddle attachment at all. The paddle is good at incorporating ingredients initially, and that's how I use it. It's goal is even distribution of flour and liquid, especially. I don't think it has much of a role in gluten development otherwise. 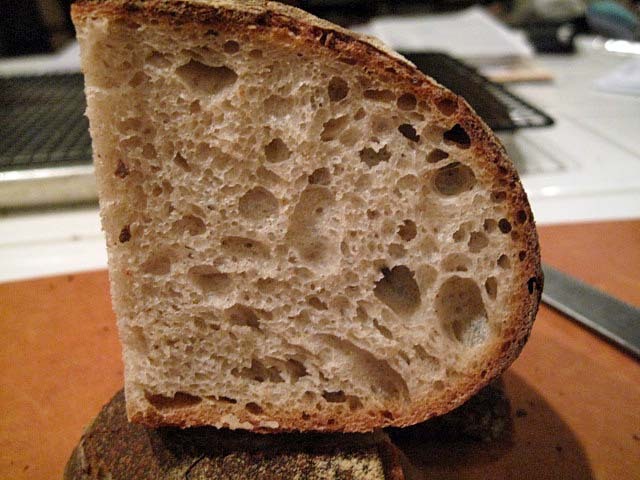 If you are somehow dissatisfied with the crumb you are getting, you might post your question (with your recipe and photos, if possible), and I bet you will get lots of good advice. I was just about to mix and thought I'd check back in for your response before I went ahead. I'll try your method and get back to you . Thanks again for getting back to me , much appreciated. Nice David. The whole works, crumb, especially that crackly crust, color. Great outcome. what hydration do you mean when you refer to mature "liquid levain"? Liquid levain @ Cathy B.
Hamelman calls for a 125% hydration levain. If I have the time, I convert my usual 75% hydration levain to 125% for Hamelman's formulas that call for liquid levain. I also convert it to 50% hydration for his firm levains. If I don't have time to convert, I just compensate by adding more or less water to my seed starter.